So if you haven’t noticed, I not only am obsessed with bacon and cats, but also enjoy comic books. In fact, I am the co-host of an online comic book review show called The Read Pile. Back in May of this year, we reviewed a comic that was sent to us by Aw Yeah Comics, called “Christopher Daniels & Kazarian Wrestle Aw Yeah Comics!”. During Episode 4, we did a review where it was revealed that I was being “nice” with my review and Ric exposes my original review. Christopher Daniels actually reaches out to Ric asking what it was that I didn’t like about the comic…. and well, things kind of took off from there – leading to me calling Daniels out for a bacon challenge on Bacon Day. Episode 4: We review “Christopher Daniels & Kazarian Wrestle Aw Yeah Comics!”. Episode 5: Elle throws out a threat to Daniels. Episode 6: Elle challeneges The Fallen Angel to a Bacon Challenge. Episode 7: Christopher Daniels responds via video. Episode 8: Ric tries to talk Elle out of the challenge, but she just feeds the fire with another response back to Daniels. Episode 20: Bacon Day coming up… challenge coming up? Episode 21: Elle has some words. Episode 21: Ric talks about his Bacon Day experience. 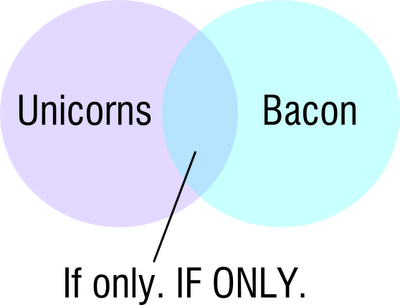 Unicorns and Bacon… Who Knew? 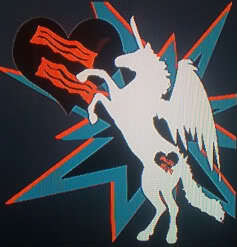 Unicorns and bacon. Why put them together? Well, they are both magical and can make you smile at first sight. 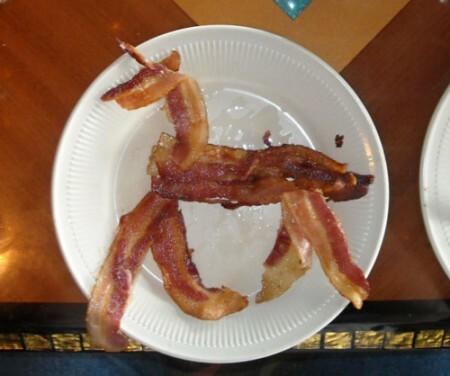 The Kitchen Project made a unicorn out of raw bacon. I actually think it looks pretty awesome! Cupquake made some fun “Unicorn Bacon Cookies”. No, the recipe doesn’t actually call for bacon, but you could easily add it if you wanted. 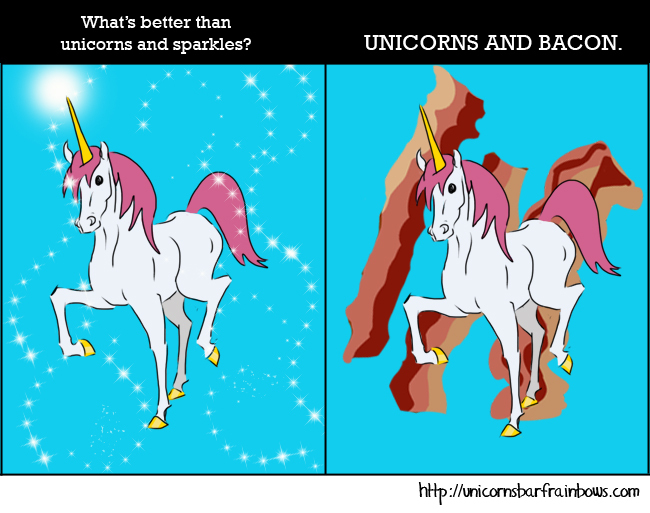 The idea is that unicorns are made of rainbows so the cookies are rainbow colors and formed to look like bacon strips. 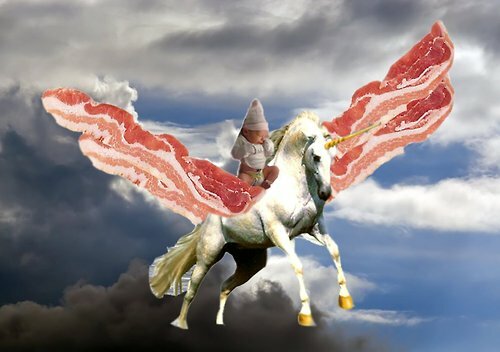 So, you get unicorn bacon strips. I loved the concept so much, I overlooked the fact there was no actual bacon involved and included it into this post anyway. I do love The Simpsons. Maybe not the last couple seasons as much as the ones before, but it’s a lifetime love I just can’t give up on. I grew up on them and have always had them around. And there have been some great mentions and displays of bacon the show. But I will never understand how Homer twirls his bacon on his fork. No, seriously. Watch closer next time. I prefer mine crispy. Some other websites have collected bacon quotes already, which I will share. I gathered as much bacon-related Simpsons material as I could find so you could enjoy it here in one spot. The Golden Ticket, a trip to “Farmer Billy’s Bacon Factory”. Yeah it’s not the only animated series to do a reference to Charlie and the Chocolate Factory. Futurama did one for the Slurm Factory. Family Guy did one for the Pawtucket Brewery. But I get a kick out of these references and love how they went with a bacon factory for Homer. Thank You, Bacon Wrapped Media for making These Up! Check out the website for more pictures.